When it comes to learning about baking, I swear by the detailed explanations of baking theory as well as excellent recipes in Baking at Home with the Culinary Institute of America, so I was thrilled to find a new book from the Culinary Institute of America on gluten-free baking, Gluten-Free Baking with The Culinary Institute of America by Richard J. Coppedge Jr. The most important principle I’ve learnt from this book is considering the protein content of flour mixes, and then selecting flour of the appropriate protein-level for the recipe. This is similar to using standard wheat flour of differing protein levels in the form of cake flour, pastry flour, bread flour etc. In Chinese language, wheat flour is labelled as low, medium or high protein. Do take a look at the page I wrote earlier about flour, including points on protein levels. In Gluten-Free Baking with The Culinary Institute of America, Richard Coppedge gives five different flour blends listed in order of protein content. 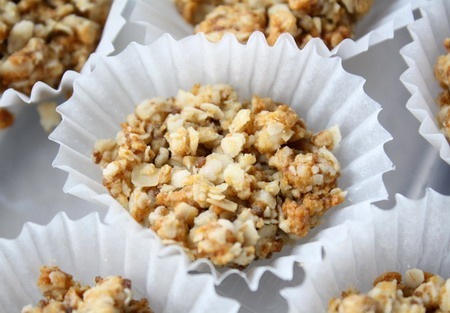 In the 150 recipes in the book, he uses each flour blend according to the texture required. Often he also uses a mixture of the different flour blends to refine the final product. Not being quite as fussy or precise about my baking results, I haven’t been following his recipes exactly, but simply putting together the flour blend that I find most convenient. Besides, not having albumen and whey powder, I’ve been unable to make up Flour Blend #3 (moderately strong; made with white rice flour, potato starch, guar gum and albumen) not Flour Blend #5 (the strongest; white rice flour, tapioca starch, defatted soy flour, whey powder). As compared to the gluten-free recipes posted earlier which use bean flours liberally, this flour blend has less of a strong taste. Report of muffin recipe using this rice, tapioca & soy flour mix coming soon. It being the Christmas season and with plenty of sales in the shops, you might be looking to buy an insulated mug. I just saw a newspaper ad for a Thermos warehouse sale this weekend — sorry, I can’t remember the details because I already have enough insulated mugs & flasks and don’t intend to buy anymore (^_^) ! 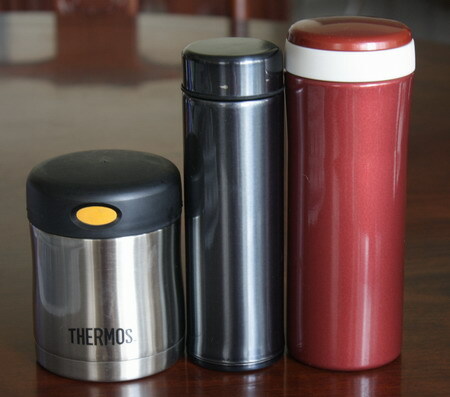 These are three stainless steel insulated mugs that I have: 290ml Thermos food/soup jar, 300ml Tiger brand slim mug, 450ml Tiger mug with compartment on top of lid for storing tea leaves. Not in the photo is a large 1 litre Thermos food flask I have in which you can make congee (rice porridge). I’ve learnt that one of the very important thing to look out for is whether the screwtop grooves are on the inside or outside. 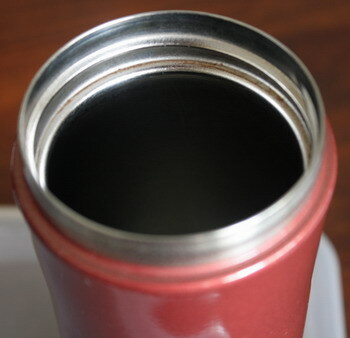 Initially, I used my 290ml Thermos food jar for hot beverages such as tea and powdered grain drinks but soon found that the drink would seep down the grooves and drip down the outside of the mug, making for a very sticky experience. With solid foods, or if you only open the mug once or twice, this is not a problem, but with hot powdered grain drinks, I would replace the lid and shake the mug in between sips throughout the day and every time I opened the lid, I’d end up having to wipe my hands and the mug with a wet tissue (or oshibori, if lucky enough to have one on me ^.^). To solve the problem, I got my second insulated mug, the burgundy-coloured 450ml Tiger brand one, where the grooves are on the inside. I discovered that of all the stainless steel insulated flasks on sale in Singapore, only Tiger brand has the grooves inside. The bad news is that the big sales – sometimes storewide at department stores or for individual stainless steel brands such as Thermos and La Gourmet – usually exclude Tiger brand. Tiger is also the most expensive of all the brands T_T. This particular Tiger model has a ‘take-apart stopper’ where the rubber parts can be removed to make cleaning easier. Tea-drinkers can also use the screw compartment on top of the lid for storing tea leaves. However, I’ve never used it as I usually brew tea in a pot and pour the ready-made tea into the mug. After using my 450ml Tiger flask mostly for carrying tea, I realised that almost half a litre of tea is simply too much caffeine for me, resulting in stomach discomfort (and insomnia if drunk in the evening). And with no/low caffeine or herbal teas, such as kukicha, mugicha, or oksusucha, a large amount of strong brew can produce a rather unfortunate laxative effect on me! Which led to the purchase of the 300ml Tiger slim mug. This is about the volume of a normal coffee mug, with an elegant, lightweight design that makes it perfect for the lunchbag. I use this flask almost everyday now. It’s so well-used that the charcoal-coloured coating has been scratched in a few places already. 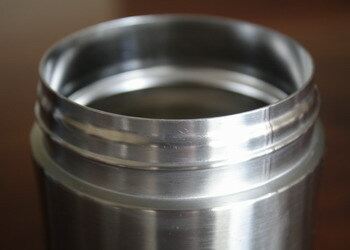 A final word on choosing stainless steel insulated brands, I totally wasted my money on a La Gourmet mug. It’s the type with plastic lid that has a small opening with a sliding cover for you to drink from. No matter how I screw the lid on, the liquid leaks out through the screwtop grooves when I try to drink. The leakage is so bad it’s completely impossible to drink with the lid on. In fact, my freebie giveaway stainless steel mug with where the plastic drinking lid is sealed with a rubber gasket, works way better. Will never be tempted by cheap La Gourmet prices again.